When I write I usually know what I want to happen at the beginning and end of a chapter, but not really how the characters are going to get me from point a to point b. Well yesterday my characters (driven by brain-pain I’m sure) took me on an adventure that not only got me from point a to point b, but showed me how I’m going to solve a plot stumbling-block I was facing. The characters just pointed down a path and shouted run! Anyway, long story short, the writing went really well. I pounded out a couple of thousand (brilliant) words for my latest novel (I’m calling it Broken Dreams right now) in an hour and a half. The most exciting part of this productive burst is it puts me only two chapters away from the first Pinch Point in the novel. I’m in spitting distance of the half-way point; so cool! Just to prove creativity causes pain…or the other way around, I thought I would share a conversation I had with my boss yesterday. Quick question…Is it still a conversation if the other person’s contributions are just strange looks and muffled laughs? Me: The right side of my head feels like it’s going to fall off. Boss: I hope it doesn’t. Me: It probably wont, it never has before, but today it feels like a real possibility. I bet it hurts because I use it too much. 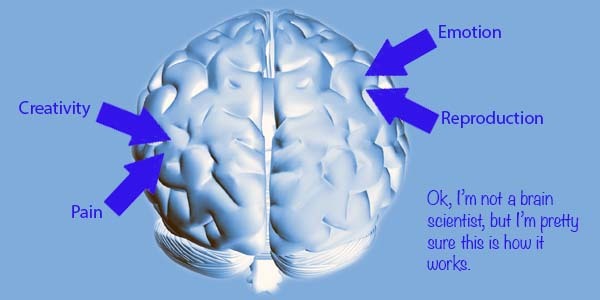 So today I’m going to use the left side of my brain instead. The left side is for rationality. Me: It’s the atrophied side of my brain. Not all muscly from use. I hate that over-muscled look. Me: I hope my left brain doesn’t get sore now. Its not used to exercise; totally the couch potato part of my brain. Boss: <failing to hold a straight face> I hope you don’t get sore. Me: Me too. Hello Friday. Words have literal meaning and meaning that is given to them over time by cultural associations. Using these words in writing allows us to subtly (hopefully) set the emotional and physical stage for our readers. Words can also take the reader down a word-association tree of thought, helping us guide the reader to think of one thing while we are saying another. Reading and writing this way may not come naturally, but it is a skill you can develop by consciously thinking of words and their associations. Start with the word “dark”. Think about the word. Do a mind map. What associations do you have with this word? Write a paragraph where you use the word “dark” to describe something unexpected (poem or pros, your choice). Now turn it around and choose a setting where you want to imply the word “dark” using the associations you developed in the first half of this exercise. If you are having trouble, read below for a simple example of this exercise using the word “light”. Coloured leaves flutter to the earth. Playing with the light; moving pictures form on limbs that reach for the heavens. You too stand in the light. Arms raised. Seeking. Free. Paragraph using the ideas I had behind light, to visual light a personality. Gentle and warm you caresses my skin. Teasing a smile from my lips as you come and go playing childish games with weightless fellows.